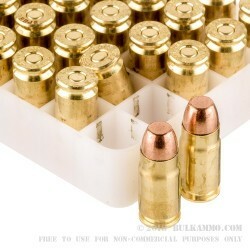 Speer ammo, a staple in the world of bullets and ammunition. 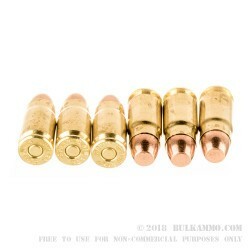 Their famous TMJ or Total Metal Jacket bullet design is a popular favorite within the law enforcement communities. Vista Outdoors is the juggernaut behind Speer ammo, along with multiple other well-known giants in the tactical world such as Federal ammo and American Eagle. Speer's 357 Sig 125 grain TMJ ammunition is loaded into a new, heavy walled, thick, reloadable, Boxer primed, yellow brass shells. The muzzle energy these rounds produce is measured at 487-foot pounds, and they also report a fast-moving muzzle velocity of 1325-feet per second. These rounds come in large 1000 round cases that are the ideal companion to any trip to the range for you, your family, you department, or your friends. Grab some today. 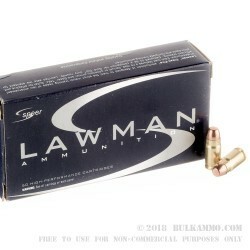 Speer Lawman Total Metal Jacket ammo is well known, revered, and respected all over the USA for its consistent quality. The Speer bullet has built its name little by little through innovation, hard work, quality components, and still holds its place as a heavy weight in the ammo industry. Law enforcement officers and federal agents throughout the United States load up and use Speer Lawman TMJ rounds every day, you should follow their lead. Stock your armory full of multiple 1000 round cases, and you'll be ready for the next visit your department takes to the range or any training course. Start building up your stockpile today.